The company was formed in 1954, following the placing of an order with British Insulated Callenders Cables Ltd by the British Columbia Electric Company, to manufacture and lay a high-voltage power cable between the mainland and Vancouver Island. 93½ statute miles of cable was made in a factory at Trafford Park specially built for the purpose. To enable the cable to be loaded aboard CS Ocean Layer a gantry 670 ft long was built between the coiling shed and the dock. The cable when finished was nearly 4 inches in diameter and had a hollow steel core which was filled with gas to a pressure of 300 psi. To carry the required power five cables were laid in parallel across the Strait of Georgia and across the Trincomali Strait. An overhead line crossed Galiano Island to complete the line. After an 8700 miles journey Ocean Layer began laying the cable on 18 July 1957 and the switching on ceremony took place on 25 September. 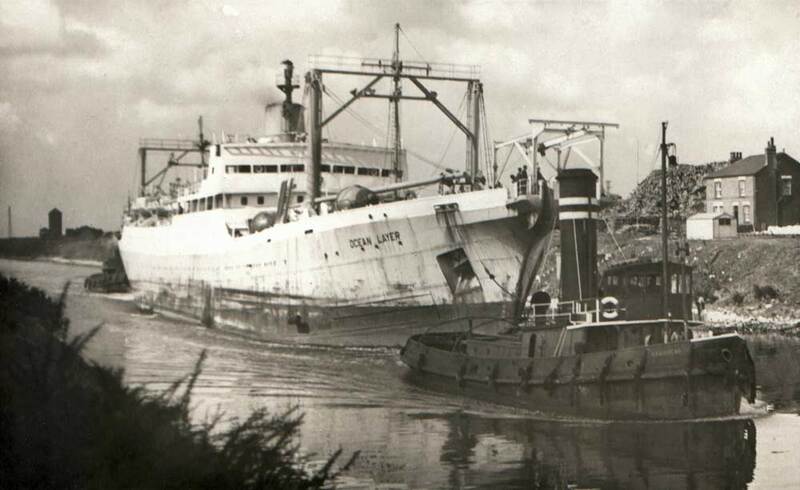 1955: CS Ocean Layer heading up the Manchester Ship Canal to the Trafford Park Works of W.T. Glover & Co Ltd., to load power cables for British Columbia. The leading tug is MSC Tug Cadishead. The next order received by the company was for a submerged gas main across the Strait of Georgia. The pipe was to be constructed in a similar way to the HAIS pipe used to supply fuel the Allied Forces in France following D-Day. 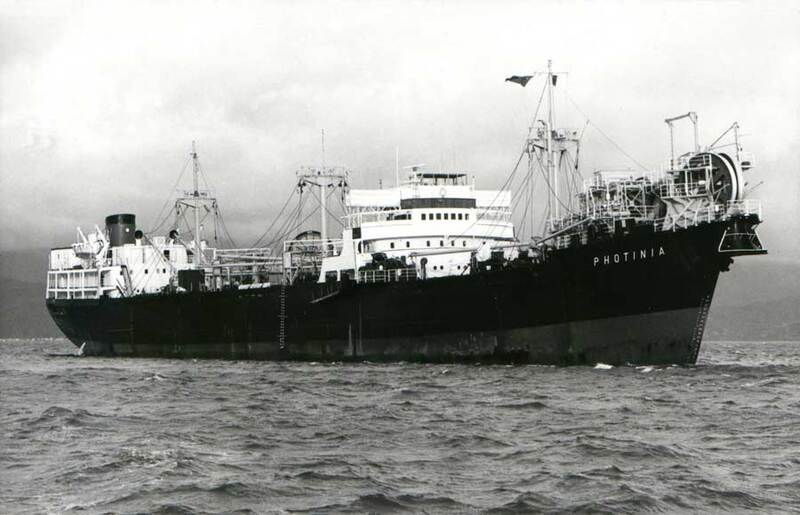 As CS Ocean Layer was no longer available SS Photinia, a Stag Line bulk carrier, was chartered to carry out trials. The cable gear was designed by the Equipment Division of Submarine Cables Ltd. A trial was carried out but due to problems with the manufacture the contract was cancelled. An order for a cable to be laid across the Cook Strait, New Zealand, was placed with BIC(S)C Ltd., in 1961. The cable was manufactured by British Insulated Callenders Cables Ltd at Trafford Park, Manchester. SS Photinia was chartered to carry out the laying. The cable equipment was designed by Submarine Cables Ltd. One cable end was laid at Oteranga Bay, North Island on 12 November 1964 and the other at Fighting Bay, South Island, the following day. Three cables each 25 statute miles long were laid, one being a spare. Another power cable laid by Photinia was that between the islands of Trinidad and Tobago in 1965. BICC at this time owned 50% of Submarine Cables Ltd., through its takeover of the Telegraph Construction and Maintenance Company Ltd in 1959. In 1966 it sold its share to AEI Ltd who already owned the other 50% through their merger with Siemens Bros.
At the same time that BICC sold its 50% stake in Submarine Cables Ltd., British Insulated Callenders (Submarine) Cables Ltd., went into liquidation and subsequent power submarine cable work was undertaken by another BICC subsidiary, Balfour Kirkpatrick Ltd.
Photinia was a bulk carrier owned by the Stag Line. British Insulated Callenders (Submarine) Cables Ltd chartered the vessel to carry out the laying of power cables across the Cook Strait, New Zealand. BICC had an option on Photinia until October 1976 and this was taken up in September 1976. The cable machinery, which had been designed by Submarine Cables Ltd., was refitted by Swan, Hunter & Wigham Richardson Ltd., at their Redhead Yard. The vessel left England for New Zealand in March 1977 to carry out repairs to one of the cables. 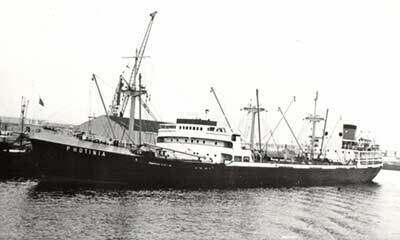 In 1978 Photinia ran aground in a storm near Milwaukee, Wisconsin, and in the following year was scrapped.